I hear this question pretty frequently. There’s Adobe Analytics, Adobe Target, Adobe Audience Manager, Adobe Experience Manager, Google Tag Manager – certainly there MUST be an Adobe Tag Manager… right? Well, yes and no. Adobe Tag Manager (version 1) was the original tag management solution for the Adobe Marketing Cloud. This was when tag management was still in its (relative) infancy. It was later upgraded to version 2 of Adobe Tag Manager, which I’m told was enough of an overhaul from version 1 to warrant distinction! Here’s a video of what it looked like. The interface looks a lot like something you might see in AEM. The owners of this tool quickly realized that this product wasn’t keeping pace with the market. By many accounts, it was cumbersome and struggled to really take off (I did not personally use it). Instead of building something new from the ground up, Adobe decided the best course of action was to look externally as they’ve done with many of their products. In 2013, Adobe acquired Satellite TMS from Search Discovery. Satellite was then renamed to Adobe Dynamic Tag Manager (DTM). This was the end of Adobe Tag Manager. Over the past 5 or 6 years, Adobe worked on a new extensible tag management platform that was code-named Reactor. This was a ground-up build of a new tag management system. Adobe used what was learned from Adobe DTM while also building upon its already-solid foundation. As it was, Adobe DTM was not able to scale with the increasing volume and complexity of marketing tools and technology. This technology was renamed to Adobe Launch (well… technically it’s named Launch, by Adobe Adobe Experience Platform Launch). So now Adobe DTM is being sunset and replaced by Adobe Launch. This is a very good thing. 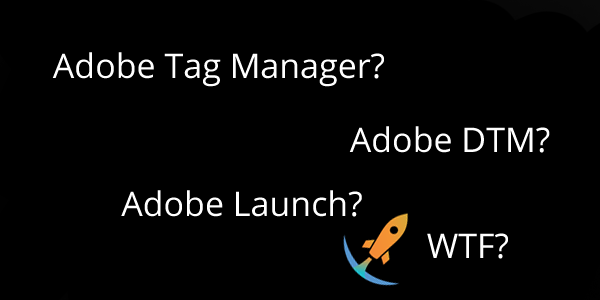 For most practitioners, when we hear someone say “Adobe Tag Manager”, some of us may raise an eyebrow; but most of us will just assume you’re referring to Adobe Launch. Hope this helps. Thanks to Till and Corey for the added flavor about Adobe Tag Manager’s versions. Also a fun tweet from Eric about its cache clearing. Literally today (3/19) I’ve been told that the name of Launch, by Adobe has been changed to Adobe Experience Platform Launch (thanks, Jeff and Tyler!). I hope we will still call it Adobe Launch conversationally – the new name is a bit of a tongue twister.